34% of all female models in this season's print fashion ads were women of colour - an increase on previous seasons. For the third season running, just 10 plus-size women were featured - out of 541. This is a really measly 1.9%. Women aged over 50 saw the steepest decline in representation. Last season, 3.1% of models were over 50, but this season it was just 1.9%. Four out of the 541 female models used this season openly identify as trans or non-binary, a decrease of 2 from last season. Davidson’s team has also called out the following brands for having the least diversity: Mango, Versace, Max&Co, Mulberry, Tommy Jeans, Tory Burch, Dolce & Gabbana and denim label DL1961. 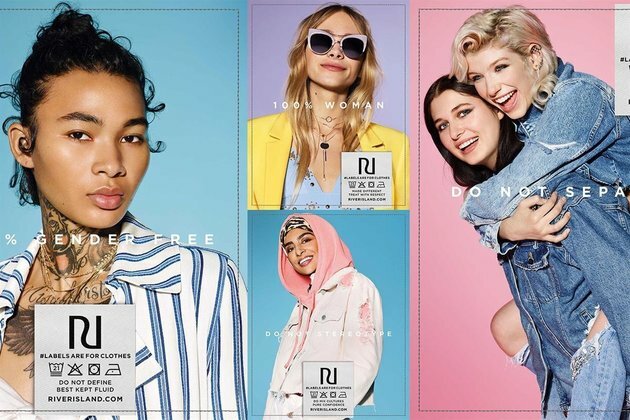 Swarovski, Nordstrom, Gloria Vanderbilt, UGG and River Island were praised for creating the most inclusive and diverse ads seen. Of the top nine models who landed the most Spring 2018 ad campaigns, none were plus-size or over 30, but four were non-white: Gigi and Bella Hadid (who are of Dutch-Palestinian descent), Aube Jolicoeur (originally of Haiti) and Shanelle Nyasiase (of South Sudan).